Both the TDI and the R are much slower cars than the Nissan 370Z I am trading in. So the difference between them is much smaller than their difference vs. the Z. They are both slow cars, relatively. But both are fun to drive, which is what I care about. Such boring colors. The Germans have no sense of whimsy. Where are the yellow cars, or the Tangerine, or neon green? Tried for a red one but just not many available. Maybe I'll add racing stripes? 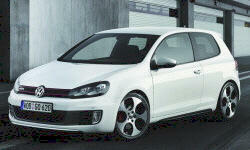 Again, compared to the 370Z neither the Golf R or the TDI are sports cars. Yet they both handle nimbly and are fun to drive. It's just a long way to fall... I liked the steering response much better in the Golf R.
I wish I had purchased the tech package with the xenon headlights and LED DLR's. The low beam headlights of the TDI are clearly weak compared to the Golf R.